Time for an oil change. My previous Pulsar blood was a concoction of Respol fully synthetic 4T 20W50 (800ml) and Motul 300V 15W50 (400ml). The Repsol was what remained from the oil change when I was in Phnom Penh’s Bajaj dealership, and the 300V was what remained of the oil that I brought along for the long SE Asian tour. To be honest, I did like the 300V. But my own research suggested that the 300V, while being an excellent oil, was really designed for “racing use” (only). At the recent Singapore Bike show, I had the opportunity to speak to the technical representative at the Motul booth. He confirmed my suspicion that the 300V was built for “racing use” and the 7100 4T was probably more suitable for my purpose – daily commute and touring. Not that the 300V is not good. It’s just that the additive package within the 300V was designed to squeeze out some additional BHP from the engine and wasn’t designed for general / extended use. Racing oils have been known to have minimal detergent in their additive package – stuff which is really necessary to keep the engine clean for street / touring and extended (or even normal) oil change intervals. Of course, Motul claims that the 300V is suitable for catalytic converters (and I believe them!). But yup. I checked – Motul’s 300V 4T is also NOT certified JASO MA or API SL that the Bajaj manual calls out for. Heck, I don’t even remember that it came with any JASO or API specifications at all! As far as the engine manufacturer is concerned, the 300V is NOT an approved oil type for the Pulsar’s triple-sparked single-cynlinder! And Motul also doesn’t claim that the 300V meets any of these specifications! And rightfully so – because it doesn’t! Hey Peter, I recommend 7100 for the street person that does occasional track days because it’s still 100% synthetic and it has ester, so it will handle high temperatures no problem. 7100 has more detergents and dispersants for cleaning which will typically allow for longer drain intervals, 5000 miles + depending on the rider. 7100 has an API rating of SM which makes in cleaner for bikes with catalytic converters and O2 sensors. 300V can be used on the street but it’s really designed for racing. 300V has double ester meaning Motul has used 2 types of esters in its formula – 1 to be used for friction reduction and 1 for extreme pressures. 300V has less detergents and dispersants vs. 7100 because they’re replaced that with extreme pressure additives for built engines. 300V is not API rated because it’s a racing oil and they assume that on a racing bike, you’re going to be pulling off your catalytic converters and O2 sensors. Hey Alex. The reason is largely due to the difference between the two products. The 300v is a high performance oil. It’s made to protect and also to free up horsepower. If you put the Motul 300v 15w50 on a chart against other oils, it would be at the lower end of the scale (meaning it’s thinner, more “slippery” and performance-oriented, due to the Ester technology and such). Conversely, the 7100 oil, when compared with similar oils would be in the middle, or higher end of the spectrum – a little thicker, more durability, etc. The 7100 is best-suited for street riding. The 300v oil would still perform well in this case, but you’ll find you may consume slightly more oil, and that you would want to change your oil a more frequently. It’s really just a trade-off between performance vs. maintenance. 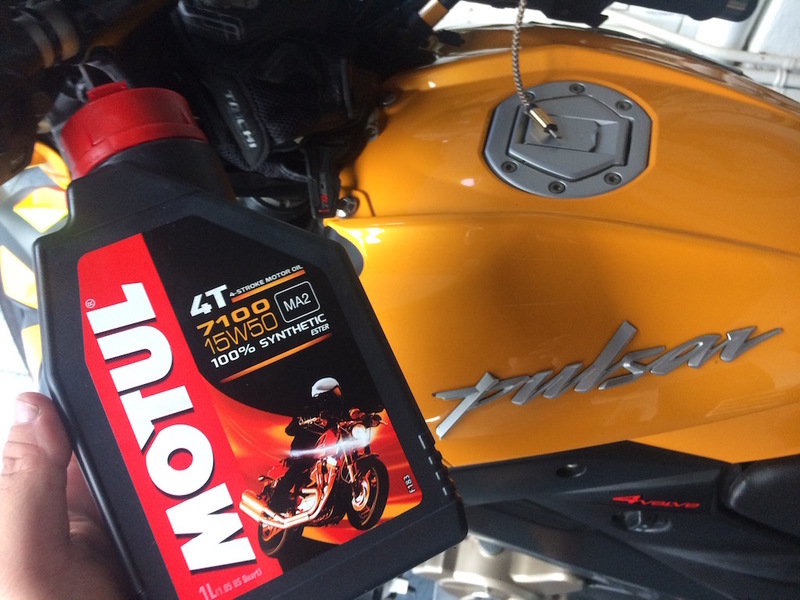 The Motul 7100 4T oil is being marketed as “a grade lower” than the racing 300V. But I suppose it’s probably more suitable for my purpose. Similar to the 300V, the 7100 is also ester-based. Which means greater film strength and natural adherence of the oil to the metal surfaces, resulting in greater protection as compared to the more common PAO-based synthetic lubricants. So, for now, I’ll be sticking to the JASO MA (in fact, it’s JASO MA2) compliant 7100 4T ester-based fully synthetic oil. Plus, the 7100 is cheaper than the 300V too! Wow really learnt a lot from your posts. Keep it up with the posts. thanks for every effort taken to write this article . It helped me in understanding bike health and oils for my bike. You’re most welcomed! Glad you found it useful! Nice post. Quick check, does that mean any engine oil that JASO MA2 approved is suitable for 200NS? Also, does it mean it is fully synthetic for JASO MA2 approved? does it matter if it is not fully synthetic? No. The manual calls for 20W50 API ‘SL’ or JASO MA. There are mineral based JASO MA compliant oils too. Also, API ‘SL’ and JASO MA oils come in different weights too. In summary, you need the correct weight AND correct specification lubrication. Oh – and JASO MA2 is merely the newer and stricter specification to JASO MA standard that includes compatibility with catalytic converters. There’s mineral, synthetic, and a blend of both – typically called semi-synthetic. I don’t think I quite understand your “synthetic or fully synthetic” – they’re quite the same thing. Of course, some companies resort to funny marketing to confuse buyers. Just find out what the base oil is for the lubricant and decide from there. Personally, I would always go with synthetic where possible and available. Synthetic lubricants resist breakdowns far better than their mineral counterparts. So when the oil gets “old”, the synthetics tend to hold up better and continue to protect the engine. Mineral-based lubricants break down and therefore loses its protective abilities. Any reason you are didn’t use the 7100 [20W50]? Unfortunately, only 10W40 and 15W50 were available at the place I bought the oil. So 15W50, being closer to 20W50, was what I chose. Thanks for the resources. If I were feeling into replacing the oil myself, I’d use mxtradings – I’ve used them for years for my car oils. May i know how often should i change the engine oil? I am currently using the 20w50. What does your motorcycle’s manual say? You should be safe following your manufacturer’s guidelines. Although almost ALL workshops mechanics I know recommend a very much shorter OCI. Obviously, the more frequently one changes oil, the more the mechanic will make. Just read this article. Informative. However i disagree with your statement. Motorcycle engine oils serve in a variety of roles within an engine, heatsink, lubrication, clutch and gear oil. Unlike cars, which has dedicated oils for each segment of the engine. With our weather, stop and go traffic in Singapore. The oil in motorcycle engines are subjected to high temperatures and searings, hence they breakdown at a much faster rate. Without regular OCI, extending it, would bring more harm to the engine. Examples include worn pistons and valves, engine headers, magnetic coil burn out. Between spending a few hundreds and down time on component changes and troubleshooting. I rather spend that on oil changes to prevent these things from happening. I left workshops who balked at me for changing my oil every 1 month or 1500km +/-, whichever come earlier. As i commute heavily everyday, and depend on my bike for transportation, oil changes is probably the least of my costs. Ermmm… I’m sorry… which statement? Motul 300V 4T exceeds all OEM specifications, including JASO MA2. But that’s not the issue. The real reason why daily-use bikes should not use 300V is because of its incredibly high molybdenum (moly) content, which is intended to mitigate high temps for constant high-revving race bikes. Use of 300V leaves street riders on the wrong end of an intended trade-off. I’m not too convinced there… I could be wrong, but I don’t remember seeing 300V 4T having any API or JASO approval printed on the label. Motul’s 7100, 5100 and even the 3100 all have JASO MA approval labeled on them. Motul is a large company. These companies know enough to NOT claim it as JASO MA/MA2 or API compliant if they are clearly not – lawsuits ain’t cheap. Motul only goes so far as to claim “OEM Approvals: Above Existing standards” on the 300V, leaving it vague enough to not attract a lawsuit. While moly is frequently referred to as a “friction modifier”, it’s primary use is as an anti-wear agent. I trust Motul to have tested the the moly dosage in the 300V to be sufficiently low to not affect wet clutch performance (slippage). If what you claimed is true – that the true reason was due to the moly content, then why would the 300V – with it’s additional ANTI-WEAR component, have LOWER oil change interval (as recommended by a Motul representative) as compared to its 7100 sibling without this ANTI-WEAR agent? I suspect that there’s more to this than just mere moly. Now, I’m not saying that the 300V isn’t a great oil – IT IS! I’ve used it, and I kinda liked its feel in my engine. But like drugs and cigarettes – while it gives you that initial high, long term (wrong) use *might* just do more harm than good. I will be changing to Motul 7100 on my next servicing. My bike currently is a new bike at 17,000km . Is it advisable to be using engine oil grade of 10W40 or higher grade? as i read online is that it is advisable for 20W50 in singapore. Are you riding a Pulsar 200NS? The manual calls for 20W50… Best to consult your bike’s manual. I currently use NS200..using 4T..5100 15W50..MA2.. Technosynthese…. do it is suitable for my ns200? Only use for daily (go to work) and touring on weekend…. Motul’s 5100 is a great oil too. The manual for my R1200Rt specifies 20W50 but I live in Canada and often start the bike in temperatures below 5C. I’ve considered using the 15W50 to help with the cold starts. Any reason this would be detrimental? Hey Chucker. I don’t profess to be an expert in this area, but my understanding is that thinner oils may be easier to start the engine with, but offer slightly less protection. In any case, the difference between 20w50 and 15w50 is likely to be minimal and insignificant.